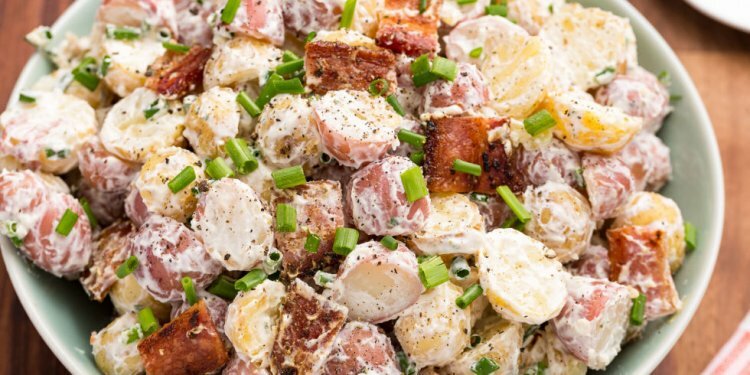 Potato salad is a classic part of summer BBQs, but the traditional kind has almost 400 calories and 20 grams of fat per cup — yikes! This summer, try my lightened version, which is flavored with fresh herbs and vinaigrette instead of a whole vat of mayonnaise. You can vary it up with whatever herbs or veggies you have on-hand, because almost anything tastes good with potatoes. Happy grilling! Bring a large pot of water to a boil. Salt the water, the add the potatoes and cook until fork-tender. Drain and set aside to cool. In the bottom of a large bowl, whisk together the lemon juice, yogurt, mustard, oil, mayo, and paprika. Add a generous pinch of salt and a small pinch of pepper, then add the celery, onion, and fresh herbs. Quarter or halve the potatoes, depending on their size, and add them to the bowl. Stir gently til the potatoes are well-coated and serve. Can be served as is or chilled first.